The price you found is 25% lower than this hotel's average rate of $369/night. Superior service, and "Nicest room I've ever stayed in"
We had a quick weekend getaway to Boston and chose the Sheraton for several reasons, but mostly due to its location. The Sheraton is perfectly situation to take advantage of public transportation or serve as a ground zero for walking to the numerous Boston attractions. Overall, our stay at the Sheraton was 5 stars, it had everything you come to expect from a top notch SPG property. Courteous/helpful staff: check. Amenities galore: check. Updated rooms: check. Breathtaking retractable-roof pool: check. Hotel bar: check. Starbucks: check. Rental car agency onsite: check. However, where the Sheraton exceeded every possible expectation I ever had was in the pre-check-in process. 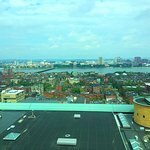 Prior to our trip, we received a note from Aliana at Sheraton Boston indicating she was would be handling our reservation and asked if there was anything she could do to make our time in Boston more special. I responded to Aliana letting her know this was a special trip we were making and we’d be doing a lot of sightseeing (Freedom Trail, JFK Library, Cape Cod, etc) and taking in a ballgame at Fenway. I also asked if she could provide some specific recommendations on restaurants and bars based on our interests. Aliana responded a second time providing a list of recommendations on area attractions and restaurants that was not canned or template response which had wonderful recommendations which we followed. Upon check-in, we found out we had been upgraded to a 24th...We had a quick weekend getaway to Boston and chose the Sheraton for several reasons, but mostly due to its location. The Sheraton is perfectly situation to take advantage of public transportation or serve as a ground zero for walking to the numerous Boston attractions. Overall, our stay at the Sheraton was 5 stars, it had everything you come to expect from a top notch SPG property. Courteous/helpful staff: check. Amenities galore: check. Updated rooms: check. Breathtaking retractable-roof pool: check. Hotel bar: check. Starbucks: check. Rental car agency onsite: check. However, where the Sheraton exceeded every possible expectation I ever had was in the pre-check-in process. Prior to our trip, we received a note from Aliana at Sheraton Boston indicating she was would be handling our reservation and asked if there was anything she could do to make our time in Boston more special. I responded to Aliana letting her know this was a special trip we were making and we’d be doing a lot of sightseeing (Freedom Trail, JFK Library, Cape Cod, etc) and taking in a ballgame at Fenway. I also asked if she could provide some specific recommendations on restaurants and bars based on our interests. Aliana responded a second time providing a list of recommendations on area attractions and restaurants that was not canned or template response which had wonderful recommendations which we followed. 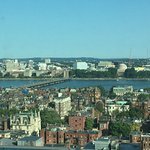 Upon check-in, we found out we had been upgraded to a 24th floor suite with panoramic views of Fenway Park and the St. Charles River. The room, and view were spectacular. 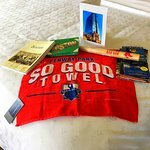 In additional, Aliana had gone the extra mile in leaving a hand written card with some Boston souvenirs on the bed. The attention to detail was remarkable, and something all Sheraton properties should strive for. We were high enough (24th floor) where you didn’t hear any of the city noise – which is a problem in many other downtown hotels. The room was large, with a separate living room. The bath was a little underwhelming as I figured a room this nice would have a walk in shower, but it only had a tub. The room had 2 big tv’s, which was nice, although we didn’t use them. My girlfriend said, "This is the nicest room I've ever stayed in! ", and that is saying a lot considering the beautiful trips and hotels we have been fortunate to experience. One of our favorite amenities was the pool. The pool is very large, and has a retractable roof. On nice days, the roof is open allowing the fresh air and sun light to filter in. Luckily for us, the weather was beautiful during our stay and the roof was open the entire time. I was a bit surprised there wasn’t a hot tub, but the unique pool made up for any love lost. It was also very convenient to have car rentals on site - Hertz and Enterprise (in the adjacent mall). We had a spontaneous need for a car and were planning to cab it to the airport just to rent a car when we found out about the onsite rental locations. Within minutes, we had a car (opted for Enterprise because they were open earlier in the morning than Hertz) and were on our way to Cape Cod. As far as location goes, in hindsight, would not have wanted to stay anywhere differently. We walked the Freedom Trail (which starts about a mile away from the hotel), walked to Fenway, walked to the shops and restaurants on Boylston Street, walked to a couple of different malls situated near Copley Plaza and walked to an AH-MAZING greasy spoon for breakfast, Thornton’s – Do not miss the Amaretto French Toast! The streets of Boston wind and meander, and rarely follow a coherent grid. A couple of times we got confused on the quickest route to a location. The guys at the bell station were more than happy to point us in the right direction. If walking is not your forte, there was always a long line of taxis lined up at the hotel waiting to whisk you away. Although, be attentive on using taxis. More than once, our taxi driver opted for much slower routes (than the freeway) that had us in bumper to bumper traffic and construction with road closure detours. On one occasion, we got out and walked to our destination because our fare was moving north faster than the car was. Just a heads up because before going to Boston, I was told to be careful of shady cab drivers, but I digress. Wow, thank you so much for all of your kind words during your recent stay with us. I'm so glad to hear that every aspect of your and your girlfriends stay was everything that you expected and more. We always strive for that effortless and relaxing stay for our guests and that is clearly what you encountered. I will make sure to extend your gratitude to Alaina, as I'm sure she'll be thrilled to know that her efforts and helpfulness were appreciated. Thank you again for staying with us and we look forward to seeing you back in Boston! The price you found is 18% lower than this hotel's average rate of $235/night. The price you found is 11% lower than this hotel's average rate of $243/night. The price you found is 36% lower than this hotel's average rate of $309/night. The price you found is 26% lower than this hotel's average rate of $430/night. Jessica Heneghan, Meeting & Event Manager was an absolute pleasure to work with! We had many requests along the planning and day of event process, but she handled those calmly and resolved them thoroughly within minutes. Also, Said Rabhi, Banquet Manager, and Brian Hoffman were incredible adapting to our needs.Our experience at the Sheraton was first class, thanks to the fine work of Sheraton's talented team. Thank you so much for letting us know about the experiences you had working with Jessica, Said, and Brian. I will be sure to let them know that you enjoyed working with them and how helpful they were. Enjoyed our family stay at Sheraton Boston. The location is great, very convenient to travel around. The rooms are clean and the view from the room is great. The hotel is link to a shopping mall and there are restaurants located around. Great family stay. Room tip: Room on the higher floor are always good. I'm so glad you and your family enjoyed your recent stay with us. We look forward to welcoming you again! Best Sleep I've Had in Ages! The Sheraton is a fabulous location in Back Bay and if you're moving a kid into Northeastern as we were. 27th floor, corner room in the south tower with the best views in the city. The bed was incredibly comfortable. I usually stay at the Colonnade but this was $90 cheaper and we were not disappointed. I am so glad to hear that you had a comfortable and enjoyable stay with us while moving your student into Northeastern. We are local but last minute wanted to go to a nice hotel, near things, with an outdoor pool. We found the Sheraton Boston. We had no idea that the lobby was so grand and nice! We also didn't know that it attached to the Pru for shopping! The pool on the roof (don't be deceived by the 5th fl location) was excellent - it has a retractable roof and on this day it was open - just what we wanted. The sunning area is a good size with a good number of lounge chairs. To order food, you need to order via room service. Unfortunately there was nothing that explained this, we just heard it via another guest. We had to go to the room to order, a little inconvenient, but all in all very convenient. The food was delivered very quick, the portions were very good and the quality of the food very good as well. The room was very good, very comfortable. We were able to walk over to Cambridge as well as down Newbury Street and Boylston - ideal walking spot! The only thing that we did not like was that the outdoor lounging area was never picked up - all of the room service foods - as well as food that folks brought in - just lay out on the patio for HOURS! Our view from the room looked down on this and it was something that kept sticking out at us. No one every cleaned the area until we looked down again in the morning. Hopefully they tend to that. Thank you so much for taking the time to let us know about your recent stay. I'm so glad that you were able to take advantage of our great location and the pool area. Your observations on cleanliness of the patio area will surely be shared with the appropriate departments. Dropping oldest at college - Nice! We've had a busy summer and have stayed at various hotels. This was the last trip and we couldn't have been more pleased. Communication for the room we needed and our time of arrival was easy. Upon arrival, check in was seamless. Our room was ready and, as it should be, perfectly clean. We mentioned to the cleaning person on our second day that we wished an extra pillow and she kindly complied (and also left us extra shampoos etc). Hallways were quiet, even in this busy holiday weekend. Lobby is always busy as it is a BIG hotel but all staff is courteous and willing to assist. This was my 3rd stay at this property and I know that they keep their quality of service high. Would recommend (business or pleasure/ alone or with family). Picture is from our room, North Tower 22nd floor. Beautiful! Thank you for taking the time to let us know about your recent stay! I'm so glad that you were able to enjoy your time at the hotel and that the staff took such great care of you.